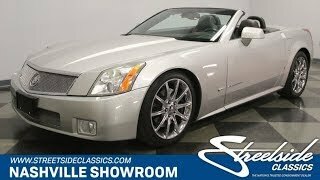 Hi, I am interested in your 2008 Cadillac XLR V (stock #1266-NSH) listed on Autotrader for $36,995. I'd like to get more information about this vehicle and confirm its availability. If you enjoy driving a sportscar, but would like to arrive at your destination in style, exhilarated and refreshed instead of beat up and exhausted, then you should check out this car. It is a shining example of the benefits that a company like GM can bring to a limited production sports/luxury car. It has style and grace but is also a very capable sportscar that compares admirably with its much more expensive European competitors. Check it out. The edgy styling of this car has been described in many ways, but sharply chiseled seems the most appropriate. It describes the shape of the car and its crisp clean lines while also suggesting how solid the car is. It is technically a retractable hardtop roadster dressed in Light Platinum paint. When the roof is up it looks very serious of purpose. When its down, it looks more like success out for a Sunday drive. Cadillacs V versions are synonymous with the hi-performance versions of the model. So, take an already potent XLR, and step it up a notch. There are a few signs that let you know this is the most potent version besides the badge on the trunk. There is the beautiful polished wire mesh grill as well as the polished 19-inch alloy wheels and the four exhaust pipes peeking out from under the rear bumper. Vertical taillights that cut forward along the top of the fender are unique and headlights sculped into the fenders cut a clean path through the air. Open the door and you will find an interior full of the luxury features and quality craftsmanship that you expect from Cadillac. It is rendered in Ebony with leather and suede seats and accents. The door panel sets the tone with a suede center panel just above a comfortable armrest with Zingana wood gracing the door pull and the power window switches at your fingertips. Settle in to the power adjustable, heated and cooled leather seat and get comfortable. Reach out for the steering wheel that you can heat for a comfortable grip on cold days, and notice the technology controls under you thumbs on both sides. The dash puts the tach and speedo directly in front of the driver with the engine gauges off to each side. The center console is trimmed out in more of that beautiful Zingana wood and it houses an LCD screen for the Nav and the Bose stereo systems with the ventilation controls below it. The shifter for the automatic transmission falls easily to hand and a center console provides another nice armrest. Raise the hood up and you will find a supercharged Northstar V8 with a dress up kit that looks sleek and clean, but unfortunately hides so much of the wonderful technology that makes this car quite potent. That tech would be a supercharged, dual overhead cam, 4.4-liter engine that pressurizes the air and feeds it through 4 intercoolers that are built into the intake manifold to generate 443 horsepower. These engines are so special that they are built by hand, one at a time, by a team of experienced craftsman. The power is sent back through a 6-speed automatic transmission to the rear wheels. The chassis and suspension are derived from a C6 Corvette, but everything was tailored by the engineers at Cadillac and tuned to produce the proper balance of sports car performance with Cadillac manners. Larger anti-lock brakes were borrowed from a Z51 Corvette so rest assured that you can stop this car in a hurry. You really can have your cake and eat it to with this car. It is a serious sports car with Cadillac style and luxury. Come on down and check this car out. Once you drive it, you just might decide to drive it on home.